is highly respected and well-liked by parents. (NODCC) and he speaks at the annual Conferences. Brain Development Research Study on ACC. handouts [in outline form] to read below. "How to Get the Most From Your Neurologist Visit". "Neurologic Issues in Disorders of the Corpus Callosum". You can purchase the DVD from the NODCC store. at four months and he is 17 years old. opposed to the primary driver of the issue." seen with ACC can be found on Page 8.
have a film copy as well." (for yourself). What Type of ACC is this? What are the associated CNS changes? are there that can be seen?" Is the MRI interpretation accurate? "So how do you address that?" "Who's reading the film? Is it a Neuroradiologist? looks a lot different on MRI than the mature brain. and I would pursue those." over the films with your Neurologist." them explain each finding to you. they're 3 or 4 years of age." their MRI and how they're doing clinically?" not a guideline. It's not an absolute-ism." life, should have a second MRI." through the corpus callosum crossed through there. So that's one possible explanation." located at the base of the fornix. 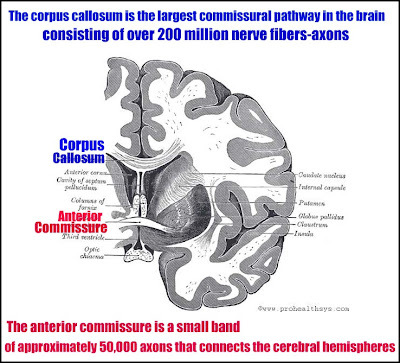 absence of the corpus callosum." lateral ventricles seen more anteriorly." missing. The ventricle's going to bulge out." axons (also referred to as fibers). and they cross over to the other side of the brain. things we'll be able to answer more definitively." on an MRI image where the Probst bundles are. of the brain matter proper." of like in between the two sides." in lieu of the corpus callosum." a lipoma, will form instead. about other brain anomalies seen with ACC. ACC are going to have ACC and something else." the brain on MRI films and shows examples. picture of the structure of the brain." very uncommon causes of ACC. took questions from the audience. "The answer is absolutely yes." brain structure in the picture that he is discussing). see them being pointed out. in a grandfather, children and grandchildren. "Almost 1/4 of the kids had heart problems. with ACC is that they get a comprehensive heart evaluation." "Do they enlarge or do they stay the same?" could also be a sign of hydrocephalus." have cyst enlargements, it happens early on." ACC resources mentioned in more depth for yourself. items) available at the NODCC website. UCSF where Dr. Sherr and his colleagues are involved? Please contact: Mari Wakahiro at 415-502-8039.